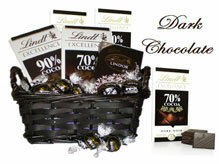 Impress a friend with this elegant Lindt Chocolate collection. This gift is pure bliss! It includes 15 of premium chocolate bars (Lindt) in different shapes and flavors. Willow basket design may vary but the over look value will remain the same. Order should be placed 2 days ahead of delivery date. 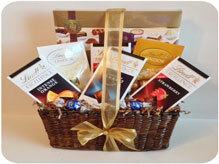 This cute chocolate basket contains Lindt finest dark chocolate. 8 of premium dark chocolate bars (Lindt) in different shapes. Perfect gift for the dark chocolate lovers! Willow basket design may vary but the over look value will remain the same. Order should be placed 2 days ahead of delivery date. 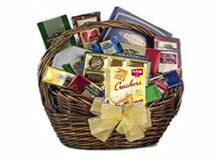 Superior Chocolate and Crackers basket filled with a selections of premium chocolate Lindt bars, Ferrero Roche, Barbecue Snack, Nuts, Crackers and more... Willow basket may vary but the over look value will remain the same. Order should be placed 2 days ahead of delivery date.